Ellery Brown was forced to use fiberglass boats as a boy. He began his recovery at the age of 14 when he first stepped aboard a 1926 Alden Triangle. 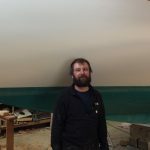 After several years spent crewing on schooners, working the yard at various boat yards and earning a B.A from Bates College, he enrolled in a 2-year program in traditional boat construction at The Apprenticeshop in Rockland ME. From there it was a short sail to Brooklin (on an Alden Triangle of course) to begin work for Doug Hylan in 2008. 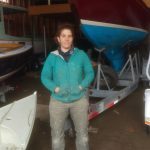 Since then Ellery’s been involved with every boat launched from Hylan & Brown- Boatbuilders, either from the shop floor, the yard, the office or all three. When he’s not at the shop you can find him gallivanting with his two boys on land, at sea and in the intertidal zone. 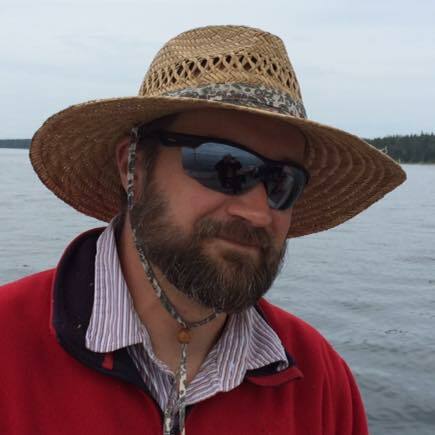 Matt Elwell has been with Hylan & Brown – Boatbuilders since Doug struck out on his own in 1998. Doug recognized Matt’s talent and far ranging capability right away, and he has been the lead carpenter or foreman on nearly every boat project, new or old, to pass through these doors. He sets the bar in the shop for craftsmanship, efficiency, and critical thinking and he is integral to the culture of excellence that is the foundation of our business. Matt has long since mastered most aspects of custom wooden boat construction. But his natural desire to learn and expand his abilities never fizzles. Kit Macchi has been a boatbuilder at Hylan & Brown since 2013. A graduate of Reed College and The Apprenticeshop, Kit showed us early on that she was capable, and game for any challenge on the shop floor. 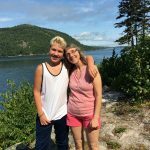 In her time here she has grown into an accomplished carpenter, having participated in all phases of wooden boat construction from planking to interior joinery and spar construction. Her willingness to jump into work in the yard, and on the water in the spring and fall is a also a huge asset to our operation. In the summer she enjoys sailing and cruising her Bud MacIntosh cutter SCOTER out of Benjamin River Harbor. Drew Scott started at Hylan & Brown in 2014. He was hired as a boatbuilder but we quickly realized we really needed his problem solving, organizational and broad ranging skills in our growing storage and maintenance operation. Drew presently manages that operation in addition to performing a healthy portion of the work itself. Born and raised in Maine in a family of sailors, carpenters, and tinkerers, Drew returned in 2007 from over a decade away to once again “mess about in boats”. 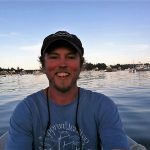 He is a graduate of the two-year traditional boatbuilding program of the Apprenticeshop in Rockland, Maine, an avid sailor, and has his own small fleet of tired wooden boats from the 1930’s and 1940’s to keep him out of trouble on the weekends. Naomi Bishko came to work for Hylan and Brown in 2015. We only wish we’d met her sooner. She began finishing boats in 1994 and never looked back. 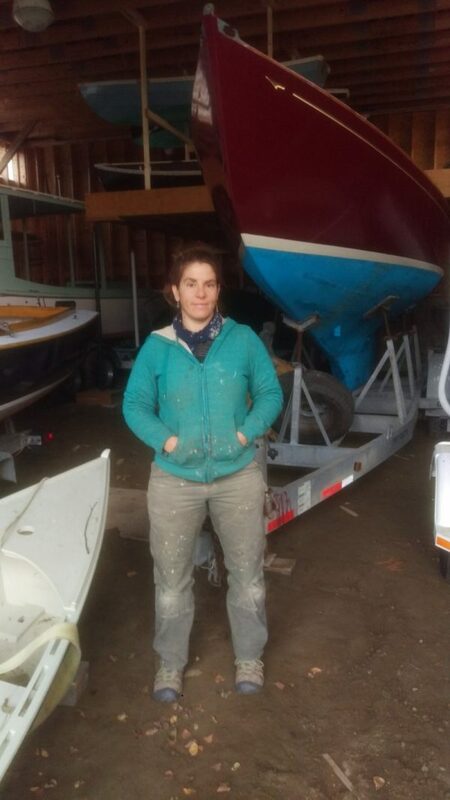 When asked about her start in this industry she’ll tell you, “After my first day of sanding I knew that this is what I wanted to do when I grew up.” She preps, paints and varnishes nearly every boat we launch. Her natural ability, combined with attention to detail and a deep understanding of what causes finishes to fail and how to prevent it, have quickly made her a key member of our crew. In her free time she enjoys spending time with her 3 grandchildren. Site designed and implemented by Daniel Gonneau.